We are honored to announce that Essentia, the framework to create, access and operate your decentralized digital life, is one of the sponsors of The North American Bitcoin Conference, which is a part of World Blockchain Forum: Investments & ICOs! 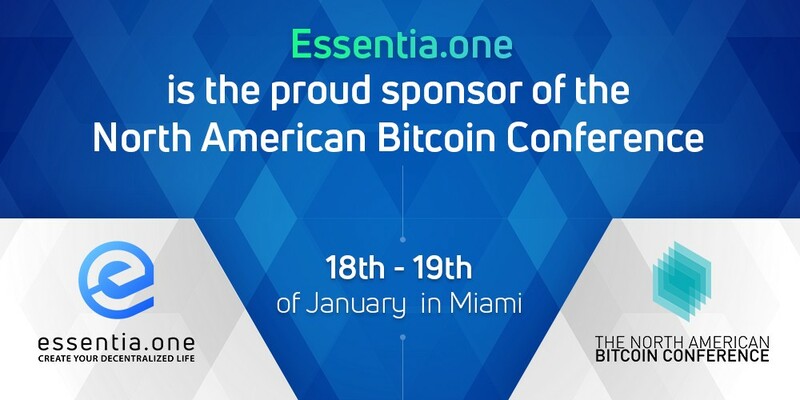 On the 18th and 19th of January, the Essentia team will visit Miami to take part in the globally recognized event in the blockchain industry. The North American Bitcoin Conference aims to gather opinion leaders and innovators in the crypto world together in one place. You will have an opportunity to meet and interact with people who are making a huge contribution in this prospering field. You can listen to speeches about blockchain and disruptive technologies from this year’s speakers, namely Dr. Patrick Byrne (CEO at Overstock.com & Founder, tØ.com), Brock Pierce(Chairman, Bitcoin Foundation), Charlie Shrem (Bitcoin pioneer) and many others. We are delighted to be able to present Essentia to all members and participants of the most important blockchain conference of the year and to discuss new issues in the cryptocurrency community with like-minded people. We welcome everybody to come to the Essentia stand and get an in-depth insight into our project. This conference is very important for us, as it provides one more chance to spread Essentia to the world. We look forward to meeting everyone who has taken an interest in our project and would like to invite each and every one to share this experience with us! Don’t be late — be a part of the conference; you can buy a ticket even now!